FILEforce is a record management, information filing and storage system, specialist. Headquartered in Brisbane, Australia, FILEforce Group has ventured into Asia Pacific regions like Malaysia, Singapore, New Zealand, Philippines, Indonesia, Thailand, and Vietnam. FILEforce has helped organizations in the public and private sectors to work smarter by improving their document filing systems. After 40 over years in the records management industry, FILEforce has a long history in helping clients establish modern, fool-proof, compact, durable filing systems. Our system is so good, most of our business comes from user referrals. We deliver solutions for a wide range of client groups and industries as diverse as Accountancy and Legal, Graphics and Printing, Medical and Education. 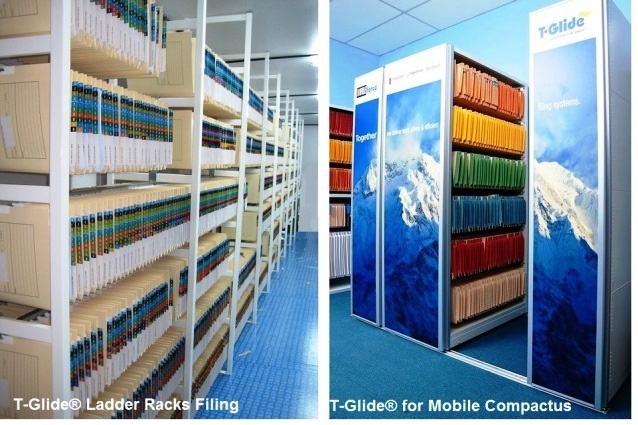 After extensive research, our unique and superior filing system, the T-Glide® System, is identified as the filing solutions that are efficient, practical and space-saving. No other product has emerged that replaces or even compares to the T-Glide® system’s time saving and space saving features. In support of T-Glide®, we only sell premium filing and stationery products. FILEforce Group is the manufacturer and distributor for all T-Glide® products and solutions. T-Glide® is a registered trademark of Filewell Systems Pty Ltd, member of the FILEforce Group. T-Glide® paper files are sourced from plantation forests and all materials used in our products are completely recyclable. In addition, FILEforce also provides the easy-to-use Enterprise Content Management (ECM), a total digital solution with PaperVision® Enterprise and ImageSilo®. FILEforce is an authorized reseller of Digitech Systems’ ImageSilo® and PaperVision® solutions. ImageSilo® and PaperVision® are registered trademarks of Digitech Systems, Inc.